Harness the power of AJAX to deliver your customers to the products the need quickly! 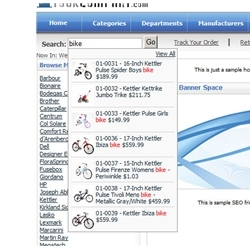 Our tSearch add-on displays search results as you type for the ultimate in search efficiency. Maximize customer satisfaction and promote repeat business! *Although tSearch is designed to work both with and without our powerful cSearch add-on, we recommend using them together to offer the best possible search functionality for your users. For even more functionality and a splash of interactivity, tSearch is the perfect add-on to your ecommerce search system. Customers can see realtime results as they type, getting to the products they want faster than ever! Powered by AJAX technology, we recommend tSearch as a great addition to any ecommerce site. Using the same powerful search algorithms as our cSearch and xSearch products, clickable results appear directly below the search box with keywords highlighted for reference. tSearch starts displaying results after typing the first two characters and you can easily change the number of instant results that are displayed. Style and design are customizable with CSS code for completely seamless integration. - our search box above! Response:Yes, by default it does search the SKUs/PartNumbers/Name/Description/Summary, but Summary and Description can easily be disabled via AppConfigs/Settings!